With the publication of this FoxNews.com article, “Clinton pushes for more broadcasting of pro-US message, raising questions about agency’s mission,” we are starting a new discussion on the future of U.S. international broadcasting and the federal agency in charge of these broadcasts, the Broadcasting Board of Governors (BBG). The most important thing is to know what exactly Secretary Clinton said in her Congressional testimony and to realize that she was not clear or very specific on at least one point. She made several significant comments, which we will highlight after presenting her full statement. 1. We have abdicated the broadcasting arena. 2. American private broadcasters like CNN, Fox, NBC are active internationally. 3. The U.S. is not doing what it did during the Cold War. 4. BBG is practically defunct in terms of its capacity to be able to tell a message around the world. 5. We’re abdicating the ideological arena, and we need to get back into it. 1. We are in an information war. And we are losing that war. 2. I’ll be very blunt in my assessment. Al-Jazeera is winning. 3. Most people still get their news from TV and radio. 4. So even though we’re pushing online, we can’t forget TV and radio. Some of these points are quite clear, others are not. Secretary Clinton believes that most people get their news from TV and radio and that while online expansion is important, TV and radio must not be neglected. This point is quite clear, but BBG’s central strategic planners do not agree with her. We can also assume from the “information war,” “abdicating ideological arena,” and “the U.S. not doing what it did during the Cold War” comments that Secretary Clinton believes in U.S. international broadcasting that in addition to news also includes analyses and commentaries and carries an ideological message of some kind. BBG’s central strategic planners do not agree with her on that point either. They prefer global English-language originated news programs because they lack foreign language skills and specialized knowledge of foreign cultures to make it possible for them to evaluate more complex programs that include analyses, commentaries, or even political satire. Coming from the U.S. journalistic tradition, they don’t appreciate biting commentary. Having never experienced repression, they don’t see much need for commentaries and ideas. They see it as propaganda. BBG’s central strategic planners have also been pushing instead “fluff journalism” that is better done online and does not require a lot of specialized knowledge of foreign cultures. “Fluff journalism” is more tolerated by repressive regimes and therefore easier to market. It helps to increase audience size through local placement. Many of BBG’s central planners, managers, and consultants come from U.S. commercial media. Easy to place programs is something they understand. BBG executives also find it much easier to produce and control what they are familiar with. Their numbers have been growing while foreign language programs and specialists who produce them are disappearing from U.S. international broadcasting at an alarming rate. “We have abdicated the broadcasting arena” point is also quite clear. BBG’s central strategic planners have been slashing broadcasts and promoting Internet-based programming. Contrary to the Foxnews.com report, BBG members do not disagree with Secretary Clinton’s statement, although many of their senior staffers and strategic planners do disagree with her on most of the points she made. It is the senior staff that argues that if the BBG is “defunct” or “dysfunctional,” it is not because of them, but because the Board did not implement their plans previously agreed to by most BBG members. They want more authority for themselves and less interference from Board members who disagree with them. Secretary Clinton is an ex officio BBG member. It is not likely she would be criticizing her own role in overseeing U.S. international broadcasting. It’s more likely she does not like how the agency is managed by the senior executive staff who reports to the BBG’s International Broadcasting Bureau (IBB) headed by Richard Lobo, another presidential appointee. She may not agree with the strategic plan that the executive staff is pushing. She may be in favor of stronger and independent surrogate broadcasting, which the executive staff wants to bring under central control. She may be opposed to cuts in broadcasting pushed through by IBB executives. She may have been appalled by waste and mismanagement and by the public diplomacy crisis created in Russia by Radio Free Europe/Radio Liberty executives who lacked journalistic, political and cultural sensitivity. She may want more funding for U.S. international broadcasting. Unlike Secretary Clinton, most Secretaries of State have treated the Broadcasting Board of Governors as an orphan. No Secrretary has ever attended a BBG Board meeting of which they are a member or attended any meeting for BBG grantee broadcasters like Radio Free Europe/Radio Liberty or Radio Free Asia. It would make a big statement if future Secretary Kerry actually attended just one meeting or attended a couple of times a year. Secretary Clinton did meet twice with the Board in her office in scripted sessions, but at least she met other BBG members. She deserves credit for that, as does the Board for asking. Both meetings were requested by the BBG. Under Secretaries who attend BBG and grantee meetings have varied in their interest. The current Under Secretary of State Tara Sonenshine is good when she is there, which is about 70% of the time for the grantees and 90% for the BBG Board. Her attendance and participation should be rated as the best of the last four Under Secretaries by far. However in the two and a half years the current Board has been there since June 30, 2010, there have been four different representatives from the State Department. McHale and Sonenshine had the longest association with the Board. There were two others during the interim between McHale and Sonenshine. Again this is not anyone’s fault, as McHale resigned and confirmation for Sonenshine took months. The Board needs an engaged Secretary of State and this is one of many challenges facing Secretary-to-be Kerry. We present here our additional commentaries and those we received from outside experts and contributors. Please check this post for additional interesting comments which we will post as we receive them. The bottom line is that the BBG’s International Broadcasting Bureau executive staff wants more centralization, less specialization, more global programming, less broadcasting, more online content, “fluff journalism” and more central control over surrogate broadcasting, and definitely less ideological content. It is all part of the BBG’s five-year strategic plan. Secretary of State Hillary Clinton wants something different, but she is, of course, on her way out. It would be interesting to see what Secretary-to-be John Kerry wants from U.S. international broadcasting. We suspect it will not be different from what Secretary Clinton wants. They are both politicians who understand U.S. domestic and foreign public opinion. The BBG executive staffers do not. Did she mean that the BBG does not have enough money, is mismanaged, or both? In terms of mismanagement, what Secretary Clinton may have been referring to are not just members of the BBG Board, on which she also serves ex officio, but primarily the management team, now led by the International Broadcasting Bureau (IBB) Director Richard Lobo, a presidential appointee. This group of Washington bureaucrats has been reducing U.S. international broadcasting to many parts of the world for many years — although not to the Middle East. They have been moving resources from radio and television broadcasting to Internet-based programming, which has to compete with millions of news websites and blogs around the world. There is nothing wrong with expanding and enhancing online presence, but in most cases it should not be done at the expense of broadcasting. Finding the right balance requires having an outstanding management team that values the expertise of journalists from various nations working for the BBG and knows how to use it in a joint effort to build and expand audiences. The IBB management team, however, has been pushing the plan of raiding and eliminating broadcasting services despite objections from Secretary Clinton, some of the other BBG members, BBG’s own journalists, and many outside experts. The team has been rated in the Office of Personnel Management employee viewpoint surveys as having the worst managers in the entire Federal Government. In fairness to some of them, however, some of BBG’s previous and even a few current members also have favored the plan of reducing broadcasts and substituting them with Internet-only program delivery. One IBB senior staffer told BBG Watch that many of the staff decisions had been forced upon them by various BBG boards. Inside and outside critics charge that it is necessary and possible to keep and expand broadcasting while supplementing it with successful online programming at a much lower cost and without destroying broadcasting. IBB senior executives argue that they can’t do it with existing resources. Yet, they keep expanding their own bureaucracy. Their solution to creating new non-programming jobs for themselves and their associates has been to propose terminating Voice of America (VOA) broadcasts to countries such as Russia, China, and Tibet and to fire journalists and experts in foreign languages and cultures. The BBG/IBB team succeeded in ending VOA broadcasting to Russia in 2008 despite opposition in Congress, but pressure from Congress and media freedom NGOs prevented IBB executives from carrying out their plan to end VOA radio and television broadcasts to China in 2011 and VOA radio to Tibet in 2012. They have not managed to increase audience size for the last few years despite being granted increasing budgets and giving themselves large outstanding performance bonuses. Their latest plan, which BBG members are now questioning, was to replace much of Radio Liberty broadcasting to Russia with softer online journalism, which the Kremlin may find easier to tolerate. According to media reports, the BBG asked for the resignation of RFE/RL president Steven Korn who had proposed this plan. He denies that he has been fired. The Russian government has severely limited in-country broadcasting of U.S. government-funded news and information programs from Radio Liberty, but options for satellite radio and television, cross-border medium wave (AM) broadcasts, online broadcasts of audio and video, YouTube video, UStream, Google Hangout, Facebook and other social media venues still exist. Several current BBG members have been trying to revive U.S. international broadcasting but are meeting with strong opposition from the IBB executive staff. IBB senior staffers are believed to be behind attempts to besmirch the reputation of Ambassador Victor Ashe and Michael Meehan, two BBG members who are the strongest supporters of broadcasting. The senior executive staffs attacks on Board members and their authority made it into the Office of the Inspector General report on the BBG, which the BBG employee union condemned as a “hatchet job” and came to Ashe’s defense as a champion of improving employee morale and exposing waste. Another current BBG member Susan McCue has taken a lead in efforts to reform the International Broadcasting Bureau bureaucracy and the management of BBG’s surrogate broadcaster Radio Free Europe/Radio Liberty. Jeff Shell, President Obama’s nominee to be the next BBG chairman, may have his own ideas on how to reform the BBG/IBB bureaucracy if he is confirmed by the Senate. Secretary Clinton also said in her testimony before the U.S. Senate Committee on Foreign Relations on March 2, 2011 that international broadcasting remains important in addition to efforts to expand online presence. 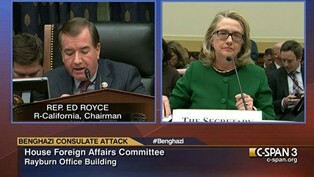 Secretary Clinton’s testimony before the U.S. Senate Committee on Foreign Relations, March 2, 2011. Although Secretary of State Hillary Clinton did not elaborate on specific reasons behind her latest statements in Congress this week that the U.S. has abdicated the international broadcasting arena and that the Broadcasting Board of Governors is “defunct,” the BBG would definitely need additional funding to expand radio and television broadcasting, even if it managed to get rid of some of its unproductive bureaucratic infrastructure. Such funding could also pay for more cross-border broadcasting, satellite delivery, and local rebroadcasting where local program placement that can greatly expand audience reach is possible without compromising the integrity of the news content due to pressures from foreign governments and station owners. I have a different interpretation of what Hilary Clinton is saying. I think she means that USIB hasn’t adapted to a more effective way of sharing America’s ideas and ideals with an important audience that is increasingly persuaded by America’s foes. If the Taliban had started a shortwave radio station, instead of using Youtube or selected TV stations, the world would be a lot safer today. The challenge is that many of these global broadcast systems were designed when oil was 50 dollars a barrel. The problem with international radio is that the audience research is only ever about numbers. I have never seen a discussion of how the audience trends could be used to make more effective, inclusive discussions in target countries. BBG meetings have always focussed on distribution arguments, with various stations justifying a new campaign or programme often by the number of reactions. I would use the word defunct. Various experiments have been tried by USIB with “new media”, like VOACongoStory. From the outside, they look to have failed to create a sustained discussion. 10 people ‘talking about it” on the Facebook, and a couple of hundred views for the majority of videos on the site. Yet, successes like Parazit are quietly forgotten when, for what ever reason, the creative team disbands. Parazit had 17 million visits a month in its heyday. Commercial stations are set up to deliver audiences to advertisers. When the audience is far away and scattered that becomes an expensive proposition to prove they are really there. Commercial international radio worked until the early 1990′s (SLBC, Radio Luxembourg). But they’re history. Commercial international TV has always been a tiny niche. It’s cheap TV, talking heads for the most part. Thank goodness US taxpayers don’t have to fund it. But they are funding VOA, Radio Marti, RFE, RFA, Al Hurra, etc. No-one dares to do the calculation of what you could do with half the funding produced by one coherent, independent entity. America has some of the finest stories to share with the world. I find brilliant, worldclass stories on TED.com, FORA.TV, and some of the YouTube and Vimeo channels. I enjoy the discussions I have with those who write, create or produce these productions. My problem with USIB is that they are still in the shouting business. And the audience they are trying to persuade ignores people who shout. Journalists write but sometimes they don’t read, or they repeat inaccurately what other people have said. We don’t disagree with Mr. Marks on anything he proposes, with the one exception of his idea of a centralized USG-funded media entity, but where did he read that Mrs. Clinton meant something else than what she actually said? Or where did he come up with the idea that when we say “broadcasting,” we must be retrograde supporters of nothing but shortwave radio? Did he even read our commentary? We did not mention “shortwave” even once, and here Mr. Marks is obsessing about shortwave, which is not the solution we propose, although it may be part of it to some areas of the world. Ours is a comprehensive, multimedia solution, not unlike the one Mr. Marks seems to favor but with some different institutional arrangements, which we believe are more suitable for the United States. When we say “broadcasting,” and we assume when Mrs. Clinton says “broadcasting,” we both mean a serious journalistic enterprise, using radio, television, satellite television, and online broadcasting, accompanied by an extensive online and social media presence. She also talked about not abdicating the ideological arena, something Mr. Marks may have not noticed, but which confirms our understanding of what the American political system wants and is willing to pay for. Mrs. Clinton’s comments reflect that political understanding. There is absolutely no disagreement between us and Mr. Marks on using digital media other than his failure to read carefully our commentary and his eagerness to put words in Mrs. Clinton’s mouth. Mrs. Clinton clearly said that while social media is important, we should not forget about “broadcasting.” We said the same thing. Mr. Marks is arguing against an argument that no one has made. We do disagree, however, with Mr. Mark’s “one coherent, independent entity” idea because it will not work in the United States. Mr. Marks is no doubt sincerely convinced of the benefits of his idea, but he may not know enough about U.S. international broadcasting history, U.S. broadcasting tradition, U.S. broadcasting legislation, and current BBG efforts to implement a solution similar to what he is proposing. Mrs. Clinton pointed out that there is already CNN and other commercial American media outlets broadcasting internationally, which limits the role of the Voice of America or any other central entity, because U.S. legislation does not allow VOA to compete with commercial broadcasters. The reason for establishing Radio Free Europe/Radio Liberty, Radio Free Asia, and Alhurra was to allow for independence, specialization and effectiveness within the American government and political context that “one coherent” entity like the Voice of America could not provide. The U.S. Congress, which understands how the U.S. government and political process work here, saw it clearly when it established the so-called surrogate broadcasters to operate alongside VOA. What makes Mr. Marks think that what was not possible or desirable before would suddenly work in the United States if only “one coherent, independent entity” were created? We can claim that we are much closer to U.S. international broadcasting that Mr. Marks has been. Centralization and bureaucratization of U.S. international broadcasting now is much advanced than it was even several years ago, and the results have not been good, as noted by Mrs. Clinton. If one, even bigger central bureaucracy were to operate U.S. international broadcasting, it would be an even greater disaster. Centralization is not the solution here because it would inevitably lead to more bureaucratization and less specialization. In international broadcasting, specialization and targeting an audience are critical, especially under the U.S. model. The U.S. never had one global audience like the BBC has. It always had many separate foreign audiences, even for its English-language programs, as in Africa. Despite of this, there has been an ongoing aggressive attempt at centralization and central planning by BBG bureaucrats. Mrs. Clinton called the BBG defunct. But the BBG executive staff has already been doing exactly what Mr. Marks is proposing. They have been pushing for centralization and managed to achieve some of their goals, but they did not increase the global audience for the last several years despite large increases in their central budget. We assume that perhaps Mr. Marks may not be familiar enough with the U.S. federal government bureaucracy or independent (public) bureaucracies that rely on U.S. government grants. USIB is not the BBC or Radio Netherlands and it will never be such because the United States is politically different from Europe. The U.S. Congress plays a key role and has a lot to say about U.S. international broadcasting. And it is a good thing, because central bureaucracies in America don’t work well, especially for U.S. international broadcasting in foreign languages. In moving toward the “one coherent entity” model, BBG bureaucrats eliminated many foreign language programs, especially at the Voice of America, and limited or tried to limit program delivery options for others. Specialists, journalists and broadcasters have been fired en masse and replaced with program advisors, program evaluators, program coordinators, and other non-programmers, consultants and contractors. BBG executives did not revive “Parazit,” a successful satire TV show to Iran, but are instead wasting money on far less successful ventures. Here we fully agree with Mr. Marks. They don’t know what they’re doing and what combination of media and program delivery to use. We agree with Mr. Marks that they are wasting U.S. taxpayers money, but we do not agree with him on one of his solutions — centralization of U.S. international broadcasting. So rather than giving these bureaucrats even more power under a “one coherent entity” model, we favor a completely decentralized model, where foreign language broadcasters specialize in what they do best, and Voice of America does its own thing. BBG should be a very small non-bureaucratic support agency. The money currently wasted there should be allocated to various broadcasters. They should be evaluated on the results they get and reformed if necessary. It’s also important to keep in mind that audience size is not always the only measure of effectiveness, especially in countries that severely limit program distribution options. The idea that one central plan, one central bureaucracy, one central program can actually change anything for the better in this respect is pure fiction, unless central planners decide that “fluff journalism” is better because it does not annoy authoritarian governments and allows for local program distribution (always much more effective in getting a large audience), which otherwise these governments would not allow. But “fluff journalism” including American “fluff journalism” is already allowed in countries like China and Russia and would simply compete there with programs from U.S. commercial broadcasters like National Geographic and others. What centralization would do is to take resources from successful specialized programs and put them in the hands of bureaucrats. They in turn will hire more program consultants and when the money runs out fire more journalists and broadcasters. BBG bureaucrats have been doing it already for many years. Rather than to centralize, USIB should decentralize and utilize all programming and media delivery option that work for individual countries and regions. Regional specialists know far better what works and doesn’t work than central bureaucrats. They also know far more about digital media in their countries and know how to use it. All of this discussion is quite interesting. Here is the bottom line: in recent years we have seen the CNNization of VOA and USIB structure, pushed along by a group of former CNN people, in some cases castoffs from that and other networks, who thought they would be able to turn the BBG broadcasters into one, or many CNN’s. One problem — the money just isn’t there. It won’t be there either, because of the decisions the White House, Congress, federal government agencies, and people will have to make on deficit reduction. Big questions need to be asked. Does the United States really need an agency that for years has been shown to be the most mis-managed entity in the federal bureaucracy? Where is the evidence that its operations have really helped turn back anti-Americanism in the Muslim world and the other remaining areas BBG directs its programming to? Many Americans would, at this point, ask the hard question — why are we continuing to spend $700 million a year on this, billions over a multi-year period, when programming and Internet material already exists, and is expanding, from non-government entities? Since the Berlin wall came done in 1989, most international broadcasters started asking the question: What do we do now? From what I have seen after living for many years in Asia and the Pacific broadcasters gave up to quickly on shortwave. While it’s nice to talk about new digital platforms, but from my experience these platforms are not fool-proof. Every time while I was in China and asked to meet some broadcasters who had come to China to meet their audience it was the same thing over and over. They only went to the major centers like Beijing of Shanghai. These were never a big audience for international broadcasters and only account for less 20% of the 1.3 billion population. If you travel outside these areas finding people with radio that have the HF bands and people that listen it very easy. The idea of cutting Chinese on shortwave to China is just as stupid as cutting shortwave to the Soviet Union would have been. Shortwave as a broadcast platform has not gone away. Yes, I agree it has changed in parts of the world. But even the Australians still use shortwave to reach parts of Australia. The problem, I strongly believe, is that the medium is not understood. Many time over the past 6 years I have sent out invitations to management of some stations to come with me to China for 6 months and they will see for themselves. But you know what, they are not interested. I would never invite them if I knew there was a chance I would be wrong. But I know I am 100% right. There are some among international broadcasters who would rather do away with shortwave because they don’t understand it or the audience. And they only see the urban audience which is connected by the internet. Back in March last year I spent an afternoon to visit a friend who works for VOA Music Mix. While we were in the studio I was introduced to (won’t say name) whose job was to digitize all content from VOA. While we were hanging out in the studio, he got into a debate with my friend after he said he wanted to cut shortwave to India. His show has a large amount of mail from India that comes from those who listen on shortwave. Way more than to those who listen online, which is tiny. But this guy from what I could tell never went to these places like India. Jonathan mentioned that TV, web and mobile platforms would better suit China and Russia. Now I can’t speak for Russia, but for China it does not work. TV, how would people see it? From the web? It will be blocked. Mobile? Same applies. It will be blocked. If international broadcasters want to know who listens to shortwave in China, they need to go in and find out for themselves. But then there is the problem that they will be accompanied by officials, so when you talk to people they won’t be very open. Just as it was in the USSR. If shortwave had no audience in China, the Chinese would not bother jamming RFA, VOA and others. They jam these broadcasts because they know people are listening. On the very popular WEIBO blog in China (if you speak Chinese and know what to look for) you will find thousands of posts that include frequencies, times and things to do to get around jamming. You need to look for it because the people that posts these need to use language that will get around the censors so the posts are not taken down. When I was in Tibet in 2006 and 2007 I was taken to meet a monk who had hand written copies of VOA, RFA and VOT programs schedules. I asked him where he got them. He responded they are circulated through underground channels. I have met many people who today make copies of broadcasts and dub the tapes and pass them around. You won’t find this in Beijing or Shanghai. In Cuba you will find the same. In North Korea you will also find the same. These are just a few examples. From 2001 to 2007 I lived in China gathering this kind of data. But every time I spoke to international broadcasters and wanted to give them this data that took me years to put together from traveling around China, they just were not interested. I think the reason they don’t understand it is because they don’t know what shortwave is. All they do is see it as a technology that goes back 100 years. As I have said many times before. If shortwave have been invented in the last 10 years, governments would be excited about it. While the Internet and other technologies have the gate keeper effect, shortwave does not. Even with jamming, shortwave does and still get through and people listen. Some of those who live in the digital world then use the argument sound quality is bad. This is also incorrect. If it’s engineered right, it can have excellent sound. When people want information and content they will do anything even listen through the static.